Directed Acyclic Graph (DAG): finite directed graph with no directed cycles. What is Directed Acyclic Graph (DAG)? In mathematics and computer science, a Directed Acyclic Graph (DAG) is a finite directed graph with no directed cycles. It consists of finitely many vertices and edges, with each edge directed from one vertex to another, such that there is no way to start at any vertex v and follow a consistently-directed sequence of edges that eventually loops back to v again. A DAG is a directed graph that has a topological ordering, a sequence of the vertices such that every edge is directed from earlier to later in the sequence. Directed Acyclic Graph (DAG) technology has been touted as the next iteration of blockchain technology, and while relatively new, has shown its technology has the potential to become the distributed ledger architecture of choice in the cryptocurrency industry. Bitcoin was Blockchain 1.0 and the decentralized Ethereum is Blockchain 2.0 and Blockchain 3.0 could be Directed Acyclic Graph. A Directed Acyclic Graph (DAG) model works differently than a blockchain. A common blockchain requires miners to maintain blocks, but a Directed Acyclic Graph (DAG) wouldn’t need either proof-of-work or blocks. Due to its blockless nature, the transactions run directly into the Directed Acyclic Graph (DAG) networks. The whole process is much faster than those of blockchains based on PoW and PoS. There are no miners on Directed Acyclic Graph (DAG) networks. The validation of transactions goes directly to the transactions themselves. For users, this means transactions go through almost instantly. With the advancement of Directed Acyclic Graph (DAG), we’re looking at a future where high functioning and minimum transaction fee chains are possible. That means users can send micro-payments without heavy fees like Bitcoin or Ethereum. To reiterate, a DAG structure looks more like a web of individual transactions connected together with “edges”, or, a connection of transactions going in the same direction. This differs from the design of blockchain that groups transactions together in blocks with each block being strung together in a chain formation. Another important factor is that Directed Acyclic Graph (DAG) eliminates the need for miners to secure the network, as each transaction verifies subsequent transactions. By doing this, the mining process, which is extremely energy intensive, is completely eliminated, making Directed Acyclic Graph (DAG) a more economically friendly distributed ledger for transactions. Who is Using Directed Acyclic Graph? Over the past year, DAG projects have picked up in popularity, with many of them taking market share away from traditional blockchains. IOTA, with its “Tangle” DAG technology, is one of the most well-known DAG projects with a top ten share of the overall cryptocurrency market. IOTA aims at creating a feeless platform to operate the internet-of-things (IoT) in which everything on the planet will be interoperable and able to talk to each other. The Tangle system is able to settle transactions across the ledger instantaneously with no transaction fees, making microtransactions a reality that was not possible before. Nano has created a feeless DAG system, known as Block Lattice, which actually creates an entire blockchain for each individual wallet. This revolutionary technology has already tested sizable amounts of transactions at high speeds. Byteball is another DAG project that promises trustless smart payments, giving users the ability to customize parameters on payments that allow a payment to be made under certain conditions. This has created new markets on the Byteball platform including insurance, predictions markets, and even sending funds via email. By using DAG, Byteball is able to complete all of these transactions in real-time, with each user confirming transactions made by other users. For example, Cardano uses proof of stake as its validation method rather than the proof of work systems employed by many cryptocurrencies including Bitcoin. This significantly reduces the amount of processing power required to validate the network. Furthermore, unlike Ethereum, Cardano utilizes a two-layered system (i.e. two sets of processes occurring simultaneously): (i) a settlement layer similar to Bitcoin to record transactions, and (ii) a control layer for executing “smart contracts” similar to Ethereum. By separating the network into multiple layers, Cardano can address problems with each layer independently. This is similar to the communications protocol for the Internet, which uses several layers including an Internet layer for routing data to the appropriate destination, and an application layer for defining the protocols used to exchange the data. The ADA coin is utilized as the “gas” for executing the smart contracts on the Cardano platform, which means users have to pay a certain amount in ADA to run a contract. Unlike Bitcoin, Ethereum, and many other cryptocurrencies, Cardano uses a proof-of-stake (POS) system to validate transactions rather than the more common proof-of-work system. In a POS system, the validator for the next block is selected based on a combination of random selection and account balance. For example, in a POS system if you own 2% of the coins, you can expect to validate about 2% of the blocks, and consequently, receive about 2% of the rewards. In a POS system, the likelihood of a 51% attack is lower than in a POW system, because it is typically more expensive to own more than 50% of the coins than it is to have more than 50% of the computing power. Conversely, a POS system is vulnerable to the “nothing-at-stake” problem, where an attacker sends a transaction, forks the blockchain from one transaction behind the attacker’s transaction, and then rewrites the transaction to himself to double-spend the currency. Because there is no disincentive for validators to mine both chains in a POS system, they will continue to mine on both validating the attacker’s transactions. However, this problem is more theoretical in nature, and is not perceived as an imminent threat. The Cardano Foundation partnered with Input Output Hong Kong (IOHK) – a technology company founded by Charles Hoskinson and Jeremy Wood who were previously involved in Ethereum. IOHK also employs Professor Aggelos Kiayias, a cryptographer from the University of Edinburgh, along with a team of researchers and scientists that have contributed to the protocol. With these great minds at the forefront of cryptography and distributed ledgers working together, Cardano has the potential to improve upon the existing platforms. Cardano is also the first academically peer-reviewed distributed ledger. Cardano has the 7th largest market cap (~5.7B) and a daily transaction volume of over $200 million despite requiring substantial development before any token holder can participate in staking and smart contracts can be deployed on the network. A few companies have indicated an interest in the Cardano platform once the virtual machine and Plutus programming language are available for use. This includes Traxia a token for financing small and medium sized businesses, which plans to migrate to the Cardano platform at the end of 2018. However, as Cardano is still in its very early stages, the majority of companies seem to prefer Ethereum at this time. In terms of security, Cardano has many of the same advantages and disadvantages as Ethereum. In some instances, staking can lead to increased centralization as only a small number of users will have enough tokens to win a block reward. An attack directed at one of those accounts could severely disrupt the network. ADA is a utility token used as fuel for operating the Cardano platform. This means that each time a developer creates a smart contract or issues a token on the platform, a designated amount of ADA is transferred. ADA may also be used as a store of value and/or for daily transactions, but its primary intended use appears to be as fuel for executing smart contracts. To perform proof-of-stake, Cardano uses an algorithm named Ouroboros which has been extensively peer-reviewed. As mentioned above, the Cardano protocol is separated into two layers: a settlement layer and a control layer. The settlement layer is used to record transactions, while the control layer executes smart contracts through a virtual machine called IELE and a programming language named Plutus, both still under development. By separating smart contracts and transactions into two layers, the development team can address problems such as scaling with each layer independently. By contrast, Ethereum records all of this information in the same layer, creating large storage requirements and in some instances, slowing down the network. Finally, Cardano intends to enact an on-chain governance system, where token holders vote on updates to the protocol, and if a majority vote in favor of the update then it is enacted. In other systems like Bitcoin and Ethereum, updates to the network are made through a fork where the chain splits into two. Miners effectively vote for the update by continuing to validate transactions from the old chain or moving over to the new chain. However, this voting occurs after the fork, so the developers can add an update which does not end up being enacted if the miners continue to devote computing resources to the original chain. In Cardano’s on-chain governance system, updates are voted on before they are added into the protocol. Cardano has plenty of potential for growth as development proceeds further. Eventually, Cardano may compete with Ethereum as developers and companies try out the Cardano platform for generating smart contracts. Moreover, the supply of the ADA coin is capped at 45 billion which it should reach in a little over 20 years.While the supply is several orders of magnitude larger than Bitcoin’s, Litecoin’s, or Ethereum’s, the ADA coin may see a spike in growth as it reaches the maximum amount. Although ADA is readily available on many exchanges, a significant amount of development is still necessary before this coin becomes viable. Currently, the proof of stake system requires users to have at least a 1% of the total supply of ADA (or about $130 million) to participate in staking. Additionally, both the virtual machine (IELE) and programming language (Plutus) for writing smart contracts remain under development. While the concepts behind Cardano are very intriguing and address many issues with other cryptocurrencies, there is still a lot of work to do to build the platform. The ADA coin has tremendous potential, but it is yet to be seen how developers will adapt to the Plutus language, or how the IELE virtual machine and the Cardano network will handle a large volume of contracts/transactions. The key differentiating factor between Nav Coin and Bitcoin is that Nav Coin is built on a proof of stake (PoS) platform and not a proof of work (PoW) platform like Bitcoin. This is a good thing for many reasons, with proof of stake being a much more modern technology. In fact, the fact that Bitcoin can’t adopt proof of stake like Ethereum is doing represents a massive problem for Bitcoin – and ultimately will lead to its demise. The cornerstone of Nav Coin is its privacy features. That is to say, that the blockchain is not publicly viewable, like bitcoin’s is. Uniquely, the coin runs on two blockchains, which serves to break any link there might be forged between sender and receiver. Compared to other cryptocurrencies, its ability for anonymous transactions is distinctive and will compete with other leading privacy coins like PIVX over the next few years. Nav Coin has plans to combine NAVTech’s anonymous transaction abilities with Changelly’s instant exchange. This fusion of technologies will be called NAVTech Polymorph. It will enable users to send a wide array of cryptocurrencies anonymously. This anonymity feature is a major pillar of Nav Coin and making it interoperate with other cryptocurrencies through Changelly is something that has never really been done before. Now, for the first time ever, users wanting to buy and sell bitcoin anonymously would be able too, with Nav Coin acting has the intermediary anonymising service. The ability to anonymously send trade a variety of cryptocurrencies including those that have no privacy features of their own is a huge feature that really sets Nav Coin apart amongst the privacy coins. A continued signal of Nav Coin’s bright future came early in 2018. On January 16th, 2018 Nav Coin announced it had passed Apple’s iOS Store technical review process which means the coin is on its way to being an approved currency within the Apple Store. This development lends serious credibility and momentum to the coin. Nav coins is available on all major exchanges and can be traded for a variety of cryptocurrencies. There is a lot of excitement around the upcoming Cardano Shelley update. The ambitious crypto project, Cardano is fast becoming a trailblazer. Branded as the 3rd generation of blockchain after Bitcoin (generation 1) and Ethereum (generation 2), Cardano encompasses many unique characteristics and features. The upcoming Cardano Shelley update is expected to be the next big release of Cardano. Before we explore why everybody is eagerly awaiting Cardano Shelley update, here’s a quick recap of what Cardano is all about and the functionalities that are available in its current release. When Bitcoin, the first generation of blockchain came into existence, it introduced a brand-new financial transaction technology that was peer-to-peer in nature and permitted borderless transactions without the need for a middle-man. Then came Ethereum, the second generation, wherein it implemented smart contract functionality. However, both the first and second generation blockchain technology had a major flaw – it caused splits whenever there was any major upgrade. In the third generation blockchain technology, the main features in focus are scalability, treasury systems, sustainability, interoperability (side chains), and on-chain governance. Cardano plans to support easy scalability on the network by implementing layers on the Cardano blockchain technology. The innovative blockchain-based platform of Cardano is based on scientific philosophy and a research-driven approach. Usually, a cryptocurrency starts off with a basic whitepaper. But in the case of Cardano, investors have a plethora of academic papers to explore. Cardano basically provides a programmable blockchain and smart contracts for dApp development. It is jointly developed by a global team of expert engineers and researchers who recognize that technology should be scalable, flexible, and secure in order to thrive as well as remain useful to millions of users. Launched in 2015 by Charles Hoskinson and Jeremy Wood, Cardano platform utilizes a rigorously and academically peer-reviewed open source code. The important features of Cardano are its coding language, proof of stake (PoS) protocol, layered technology, governance model, and treasury. Coding Language: Cardano is built from scratch using the functional programming language, Haskell. Haskell’s mathematical approach allows for code to be written in a more reliable and secure manner. Layered Technology: Cardano aims to use a layered technology. The first layer called the Cardano Settlement Layer (CSL) will focus on transactions and accounts. The native currency, ADA will be transacted over CSL. The second layer called Cardano Control Later (CCL) and it is the computational layer for smart contracts. Having two layers basically helps Cardano to have enhanced flexibility as well as easier upgrades. Governance: The future of a blockchain depends on its Governance model to a large extent. Cardano’s aim is to implement on-chain governance. Here, community proposed updates to the blockchain would be voted by the ADA token holders. Once approved, the updates would be encoded into the blockchain. Treasury: The treasury is also decentralized, wherein 25% of the block rewards are planned to be placed. The voting by the ADA holders will decide how to spend this money. Cardano is currently in the Bootstrap Era, which is code-named as the “Byron” phase. Interestingly, this phase is named after famed British poet George Gordon Byron. Byron is the first major release of the platform. It basically establishes the baseline for Cardano for letting users trade and transfer ADA. Here are the key developments in the Byron phase. Cardano SL: The launch of Cardano SL MainNet was done on September 29, 2017. Exchange Enhancements: The performance enhancements and improvements are being done to the code in Byron phase. This is to ensure that it can handle the increasing rates of activities on major crypto exchanges. 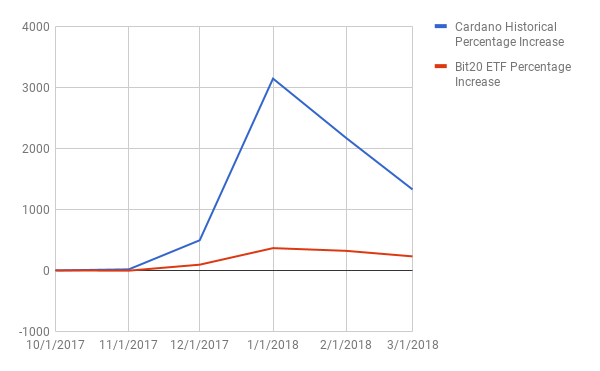 Cardano aims to increase the number of users that can be served with a fixed volume of transactions. In order to support this feature, a brand new API (Application Programming Interface), is being delivered. To ensure that Cardano can support multiple exchanges, many existing APIs are also being revised in this phase. There is already testing being done on Binance and Bittrex exchanges for quicker resolutions of any maintenance issues. A support tracking system is also created in order to monitor any incoming requests. Improvements to the design of Daedalus: The graphical user interface (GUI) of Cardano wallet, Daedalus is being improved in this phase. The users will now be able to submit bug reports from within the Daedalus application. All said and done, the fact remains that, right now, the only working protocol of Cardano is its settlement layer, wherein its currency ADA resides. Although Ouroboros is turned on, consensus is currently locked to private nodes (IOHK) until the system gathers momentum. Which means that Cardano is PoS centralized right now and the rewards are simply being burned. If we strip all the frills, Cardano is now only a cryptocurrency and is yet to release other features for becoming a blockchain platform. By mid-2018, Cardano plans to roll into its next phase called Shelley. This is when things start to get exciting. This phase is named after the English poet, Percy Bysshe Shelley. The ultimate aim of Shelley phase is for the technology to become a fully decentralised and autonomous system. Once Byron is stabilized and refined, IOHK plans to make significant improvements to its core components in the Shelley phase. The important developments expected in Shelley phase are open Ouroboros delegation, multiSig transactions, enhanced Wallet backend, consensus and incentive fees, quantum-resistant signatures, light client mode, human-friendly addresses, networking, voting centre, paper wallets. Open Ouroboros delegation: In Cardano, the transaction confirmations are not done with hardware (PoW) but with the user’s already owned ADA (PoS). This means that Cardano SL makes use of a proof of stake approach to reach consensus and ultimately produce blocks in the blockchain. A key element of decentralization is the ability of delegating stakes by stakeholders. In Shelley phase, users will have the capability to delegate their stake or to act as stake pools and have stake delegated to them. MultiSig transactions: In Cardano Shelly phase, multisignature transaction will be enabled. It is a very useful security feature that allows Daedalus to support wallets that are shared across multiple people and which enables joint control of funds. Enhanced Wallet backend: In Shelley phase, the wallet backend is aimed to be enhanced. The wallet backend basically gives Daedalus HD wallet capabilities as well as provide the link between Daedalus and the Cardano network. By enhancing the wallet backend, the performance of Daedalus would be increased, and also make it easier for third-party systems to integrate with Cardano. Consensus and incentive fees: The incentive scheme in Shelley phase would be based on sound foundations of mathematics, economic theory, and game theory. This scheme is planned to be introduced to make sure that stakeholders will fully participate in the protocol and also setup the required infrastructure for running a node. The incentive scheme will have appropriate rewards for operating full nodes, a mechanism to set transaction fees, incentives to delegate stake, and more. Quantum-resistant signatures: One of the major worries in crypto-verse is the development of quantum computers that would break cryptography. Cardano plans to mitigate this by adding a new type of transaction. This transaction will use a quantum-resistant signature scheme called BLISS. Even if the cryptography is broken, this would allow funds to be secured against being stolen. Light client mode: Currently, using a wallet for the first time or after a while requires a long wait time. This is because of the time necessary for the entire blockchain to finish downloading. In the Shelley phase, Cardano plans to include light client mode feature that would significantly reduce the blockchain syncing time. For doing this, Daedalus wallet would subscribe to a trusted blockchain checkpoint provider. A checkpoint is basically snapshots of the Cardano blockchain in time. With this update, Daedalus would only need to sync the blockchain from the most recent checkpoint, rather than the entire blockchain, thus saving time. Human-friendly addresses: The addresses of Cardano are presently a string of letters and numbers that are a lot longer than Bitcoin addresses. In the Shelley phase, the length of the address would be significantly trimmed, making them easier to communicate. This is planned to be done by minimising the information represented in the addresses and improving the way that stake delegation information is represented. Improved networking: A new network layer that gives a degree of protection to large-scale distributed denial of service (DDoS) attacks, and enables decentralization while supporting a wide and dynamic network topography over common internet infrastructure is planned for Shelley phase. A voting centre: Instead of central authorities deciding on protocol and software updates, Cardano plans to have a voting centre for this decision making. Users can use their stake or delegate it to the stake pool to vote on upcoming updates and protocol changes. Paper wallets: Paper wallets are now becoming increasingly popular as they can be used for placing funds in cold storage on a physical medium. Shelley update plans to make paper wallet available in Daedalus. The Cardano Shelley update will prepare Cardano for a range of impressive features, including smart contracts, metadata, side chains, multi-party computation, and more. Those protocols will be added gradually over time. What’s next after Cardano Shelley Update? After the Cardano Shelley update there will be 3 more releases for Cardano. First will be Goguen, which centres on the integration of smart contracts. For this, they plan to launch an IELE Virtual Machine. The testnet version of IELE will be running on the Ethereum Mantis client. After that is Basho, which focuses on performance improvements. Voltaire would be the final phase, wherein IOHK will add a treasury system and governance. Charles Hoskinson has made it clear that the Cardano Shelley update is an important step in Cardano’s grand scheme of things. The goal of Cardano is to create a secure, reliable platform that will span decades, and they have numerous experts working tirelessly towards it. We are living in amazing times indeed! Cardano Staking Pools will allow holders of Ada, the cryptocurrency on the Cardano blockchain platform, to earn money while they sleep. Cardano is one of the world leading blockchain projects. Shortly Cardano will be completing its Shelley release as per its roadmap which will enable users to delegate the staking of their Ada. If you’re a little lost, fear not, all will be explained! In a proof-of-stake network the act of staking enables new coins to be minted. This means that there are rewards available for those that stake their coins. By some estimations, roughly 5% a year can be earned through continually staking ones’ coins. Cardano is soon to enable its delegated staking features in its Daedalus wallet, enabling people to stake on behalf of others. Once staking goes live the Daedalus wallet will let you create a ‘proxy signing key’ or ‘staking key’ which can then be used to delegate your stake to another Cardano wallet. You can stake some, or all of your Ada but in general people will stake as much as they can. So I can just stake my own Ada? Yes, you can. And you should. In order to effectively stake your Ada, you need to run the Daedalus wallet 24/7 as a full node on the Cardano network. Essentially this means that you are contributing your electricity towards supporting the network, and in return, you will earn rewards for doing so. If however, you lose your connection at any time, then you are penalised for the downtime by having no chance of earning the rewards for that time. For those people that want a “set and forget” solution that guarantees their staking is happening on the network at all times, they have the option of using a staking pool. The pool will have published and measurable uptime values, so the most reliable pools will likely attract the most stakers, and will donate the electricity into the network on behalf of its stakers. This is actually a great thing and something Cardano seeks to really get right. Properly incentivising staking pools increases the number of nodes on the network as, for the most part, individual users are not willing or able to stake their Ada themselves. Rather than these users missing out on rewards, there will be dozens of staking pools available for them to use to stake for them. The more pools, the more competition to have low fees and be highly reliable. How do I join a Staking Pool? Planet Cardano is engineered for stability and high availability. The team behind the Plant Cardano Staking Pool are all experienced technical professionals. Sign up here for more information about joining Planet Cardano’s Staking Pool. How many Cardano Staking Pools are there?